Thousands of homes could have electricity supplied from a proposed solar farm in Lidsey. The large green energy venture will provide 3,000 homes with their electricity needs for a year if it is installed at Lidsey Farm between the A29 Lidsey Road and the A259 Stainton Viaduct. Planning permission for the £7m scheme will be sought by operator Solafields in a few months. The Bognor Regis area’s reputation for the most hours of sunshine in mainland Britain was a factor in the project. “The average site in the country gets 1,000 hours of full sunshine a year. It is 10 per cent more here,” he said. If the proposal is backed by Arun District Council, work will start on the site next January at the earliest. The 10,000 solar panels, 1m wide x 1.7m high, will take four to six months to install. 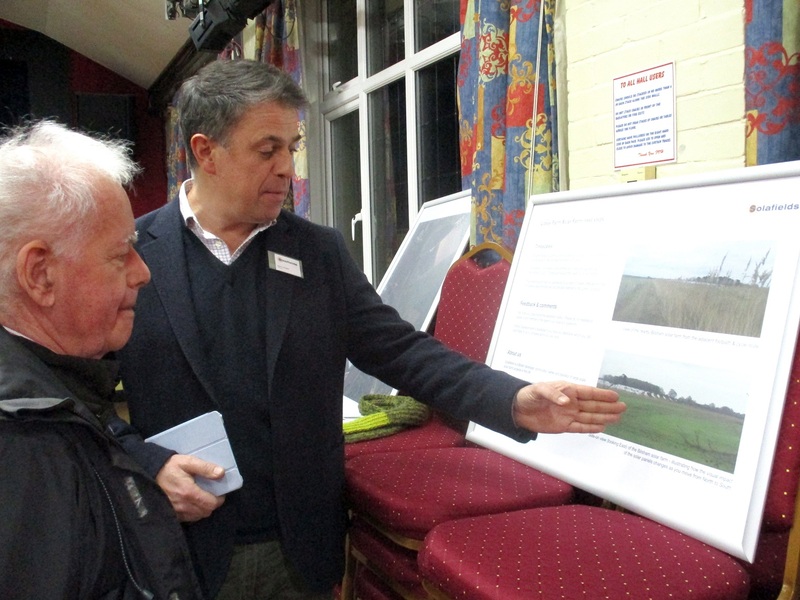 The solar farm proposals were put on display at Felpham Memorial Village Hall on Monday. A handful of members of the public visited in its first hour. Among them was Aldwick man Richard Thomas. He said: “I’m interested in what is happening to the area and how it is changing. But the main reason I am here is that I’m with the science and technology group at the University of the Third Age in Bognor Regis. This is a good scheme. I think it is exciting. Berkshire-based Solafields has 14 other sites. They include Oving and Sidlesham. The proposed solar farm at Lidsey Farm would produce 10MW of renewable electricity on a 43-acre isolated site of low-grade and flood-prone farmland. Its western boundary is the railway line to Bognor Regis and it is bordered to the east by the Lidsey Rife. Its southern edge joins the viaduct. Access will be gained through an existing service road off the viaduct and the power will be fed directly into the electricity grid which passes the site. Mr Candlish said staging Monday’s session had been worthwhile. Several councillors had also attended as well as the public. “It’s been helpful talking to the people who have been along today. They have been looking at this from a more district-wide level. “They have given us more of an insight into the strategic masterplan about the housing proposals in the area and the cyclepath networks,” he said. His company welcomed suggestions for community projects in the area which could be sponsored by some of the profits produced by the electricity. The power would also save 4,300 tonnes of carbon dioxide a year during its expected 30-year lifespan.